Looking for a terrific book series for your little dinosaur lover? Bronto, a prehistoric gentle giant, is the star in two charming, beautifully illustrated picture books from Craigmore Creations: Bronto & the Pterodactyl Eggs and Bronto, Friend of Ceratops. Using story lines that foster curiosity and empathy and hand-painted watercolor and ink illustrations, author Charlotte Vivian Rodenberg introduces young minds to science, dinosaurs and adventure and even weaves in facts about dinosaurs and the Earth as it existed then. Craigmore Creations is an independent publishing house located in Portland, Oregon. Their books celebrate the earth through art and storytelling. Craigmore Creations create graphic novels, books, picture books and educational tools that all share a common thread of natural history. Amid the leafy branches of a Jurassic tree, one kind-herted Apatosaurus comes upon a nest of pterodactyl eggs. He looks all around, but their momma is nowhere to be seen. Bronto is compelled to protect these new fledglings when disaster strikes. In this tale of caring and camaraderie, join the world’s bravest Bronto on his quest to help little wings take flight! Bronto, the big-hearted gentle giant, is back after the volcanic eruption in the Jurassic. Now, in the changing landscape of the Cretaceous, his devotion to his dinosaur friends is momentous. The Sauropods take to the hills and the Pterosaurs take flight, but one Ceratops herd has taken to the forests. When the forests become perilous, heroic Bronto rises to the occasion to aid his comrades. However, he finds he needssome help in his pursuit! My son is a huge dinosaur lover so his eyes lit up the minute he saw these books. He immediately wanted to read them and learn as much about these dinosaurs as he could! They are written really well and illustrated beautifully! These make a great gift for any dinosaur lover on your holiday list! Buy It: You can purchase these books from the Craigmore Creations website. 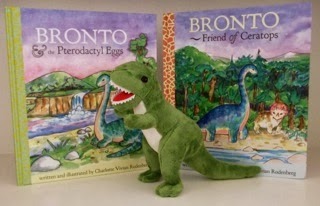 Win It: Craigmore Creations is generously offering (1) copy of Bronto & The Pterodactyl Eggs, a copy of Bronto, Friend of Ceratops and a dinosaur plush that's squeezably soft (ARV $42) to a lucky winner!